Adam Smith recommends the Amazing Grace DVD (as do I) as a refutation of the five points of Arminianism. 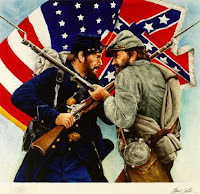 The anti-Calvinist, anti-Christian "Battle Hymn of the Republic" was the anthem of the War of Northern Aggression. Which kind of Calvinist are you? I would fall in the infralapsarian camp. "The Wanderer" reviews a couple of books about John Calvin. Bob Gonzales, Dean of Reformed Baptist Seminary,reminds us that God sincerely does desire that all sinners come to Christ. However, he also warns us not to "deny one biblical truth in order to accommodate another." Christian believes "that we are living in the most important time in all of history and that the church has a lot of work to do and it needs to believe in itself and the amazing gift that God has given us. ... To me it seems as though Calvinism creates an excuse for weaknesses and even attempts to hold us down in a negative mindset." So, I guess it could be argued that the Bible itself perpetuates that negative mindset, what with that "all have sinned and fall short of the glory of God" business. Andrew Brown has an interesting blog post on novel-writing and Calvinism. Aaron reviews Michael Horton's book Introducing Covenant Theology. since we were chosen before the foundation of the world. Thanks for the link to the review of Horton's book. I most certainly agree that "TULIP (the Five Points of Calvinism, or the Doctrines of Grace) is 'only the beginning of what Reformed theology is all about'" (p. 11).